Nuclear powered GPUs, whatever next? Going under the new moniker of 'Atomic', rather than the Toxic title that Sapphire's first X1950 wet-ware was sold under, the Asus EN9800 GX2 Quad SLI is a new revision of AMD's standard reference 3870x2. So how does it fare against it's warmer brethren? Actually, it's not much different. Coming off the back of the heavily tweaked revision to the standard 3870, the single slot Atomic, I have to say I was expecting something a little more... well, just something a little more really. The water-cooled block with it's own specific reservoir should help to encourage the dual-GPU board to overclock fairly impressively, so I thought that we'd be seeing a ramped-up version straight out of the box. 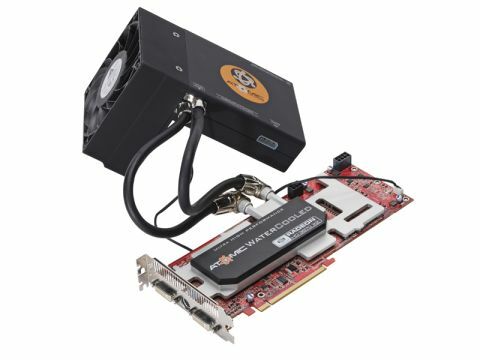 What we've got, however, is a basic reference card running at the same speeds and giving the same performance benchmarks as the original 3870x2. True, the extra cooling offers more headroom for overclocking the memory and cores of the card, but the Atomic leaves you to do all the hard work yourself. For the extra £100 over the standard AMD board, you would expect a little of that to have been done for you. Still, if you want to get your hands dirty there is some room for improvement: around 5 to 10 per cent. Not amazing, but according to our sources that's mainly because the second core is not particularly receptive to being coerced into giving out that little bit more. It's an awkward beast too. The original water-cooled Toxic had a neatly designed reservoir that sat in a spare PCI slot next to the card. Due to the cooling demands of the 3870x2, a much larger reservoir was required for the Atomic version. This is where it gets tricky. In the Antec case we used to test the card, the reservoir simply didn't fit into the standard 120mm fan slot at the rear of the case. The large block inevitably will heat up the rest of the case too and if you've got a larger CPU cooler you can just forget it. Still, since it's priced at around twice that of an 8800GTX, I'd recommend forgetting about buying this Atomic anyway.